Today, we are going to talk about key control by using high-security Abloy keys that can’t be duplicated or unauthorized duplication. In the old days, you’d stamp a Kwikset key with do not copy but they could take the key to the local shoe repair guy and get a key cut. So, “do not copy” is absolutely meaningless on a regular key. It’s not worth nothing, and we tell people that. 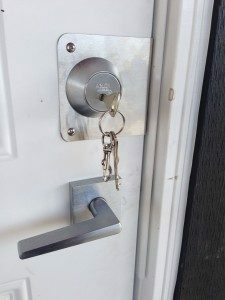 However, when you get a proper system like and Abloy, Schlage Primus or Medeco lock that have the patented key control, nobody can cut the keys unless you are the authorized person. It’s a special key Patented High-Security Key. The Abloy is key particularly good because it can not be cut by anything other than an Abloy key machine. So, if we’re cutting them, and even another authorized Abloy dealer will not cut this key for anybody at all because they just lose the whole ability to sell Abloy and a big fine from the manufacture written into the seller agreement. The Abloy keys are high security. Each one is cut individually on a special Abloy machine. 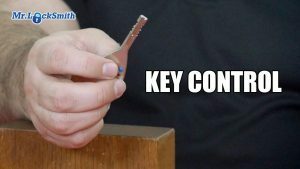 You can’t just get a machine and say, “Hey, you know, can you put this one here?” Which is a cut key and a key blank and just duplicate it like traditional ones. You can’t do that. This is Abloy Protec 2. It’s a latest technology. It does have a ball bearing inside, and that is integral in locking and unlocking your door. So if it ever pops out, which it shouldn’t, that alone will stop you from opening that door. Abloy Protec 2, when you purchase a lock, you will get a registration card that will match a two-part registration card, where you keep one part and I will keep one part, and when you reorder, you will have to present that card in order to get duplicate copies of that. So, anybody who phones my number and the key and says “I want a duplicate copy of this key” will not get a key. It could be your plumber, your electrician nanny, cook, whatever. It doesn’t really matter. The bottom line is, this is a patented key control system, it requires a special key machine to cut it, you’re not going get this cut by the local hardware store or the shoemaker. No one is going to be able to cut this. The specs are so tight, we are not gonna see them in the foreseeable future. On 3-D printer or other methods of key duplication. This total key control, when they dig up our civilization, I keep on hearing, “Oh, keys are old.” “They’re gonna go passe.” “We’re all gonna go electronic locks.” No. When it gets right down to it if you have to secure something you are going do it with a High-Security Lock and key. If you want to be totally secure, you are going to have something that has patented key control. 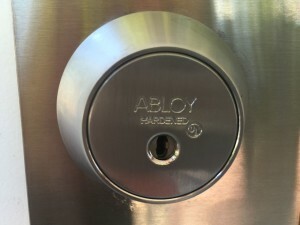 This is a high security Abloy. It’s the Protec 2. Nobody can cut the keys except for the authorized dealer only with the authorized cardholder. This is a patented system, and again, I have it on everything. I have it in the Locksmith and my house. Whether it’s a master key, regular key, or whatever. 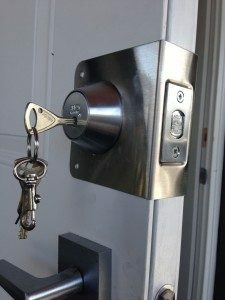 The Abloy is one of the best systems out there for key control and physical security for your home or office.